I've Kinda Figured Out What I Want! So What Now? I'm really leaning towards a Motorsailer Not a 90/90 sailboat either, I mean someone stuck a mast and sails on a trawler and called it good. Kind of running into several issues though. . .
1) There doesn't seem to be many floating around (pun intended). The style boat I really like seems to be mostly in the Pacific NW, Canada, and Europe. Not much to pick from anyways (as compared to say, a Catalina 36 or a Mainship), even less so on the East Coast. On the other hand, you get what you pay for and any of these boats seem to be well taken care of and loved. I really like the aft cockpit, which is hard to find in a smaller, affordable diesel boat (also like the Shuckers and Lancers for the aft cockpit). Salon seating is kind of meh, but does remind me of home. . .except being able to occasionally sail, it does check off most of the items I'm looking for. And while it does look good, definitely missing "that look". SO here is where I'm at. . .I could probably put my nose to the grind stone and find a nice under budget Bayliner in the next month. Or I could narrow down the MS field and hope something comes along while I save cash in the next year or two (or 3)? Or possible get a real ships mortgage and just go for it as soon as something nice pops up? Is maybe now a good time to get a Broker to start looking for me? Yeah, I know only I can really answer these questions. . .but bouncing these off experienced folks does help (better than the circle of reasoning going on in my head). Most of the sailing blogs I read have the boats under power most of the time, my advise forget about sails and mast (bridge clearance) and go straight power. One less thing to replace a couple years down the road. You have 50K? Get to 80K and buy a 50K boat then you have 30K to spend getting it right. Good luck, this is the exciting part. Then the cash eating monster lands in your yard and you're a boat owner. A Motorsailor is great in many ways. You get the ability to sail and yet you still get a Pilothouse. OTOH, there are problems. Most motorsailers don't sail all that well, and at least around here, they still spend almost all their time motoring, and rarely if ever sailing. I have never boated on the East Coast, but I have lots of family that have sailed on the lakes in NY and in the Chesapeake Bay area. There is some great cruising to be had, but much of it is shallow and many of the waterways have annoying bridges. With a motorsailor, you will always be waiting for the bridge to open. I think it is too soon to get a broker looking for you. You can do most of the looking yourself until you decide which direction you want to go. Then you can think about a broker. To me, a motorsailor is just seriously complicating matters without much gain. You have all the trawler issues but now have to deal with a mast and sails and bridge clearance and other things you wouldn't on a Trawler. That you be great if your intent was to sail 50% of the time or more. However, if not, it's a lot of pain for little gain. I really like the aft cockpit, which is hard to find in a smaller, affordable diesel boat (also like the Shuckers and Lancers for the aft cockpit). If you want a motor sailor because you feel you will need a sailing fix every once in a while, you are going to be disappointed. If you want it because you plan long range cruising, don't. Many of us are former / current Sailors, I've never looked back and enjoy going to weather in a straight line. When I need to sail, I get on a real sailboat. 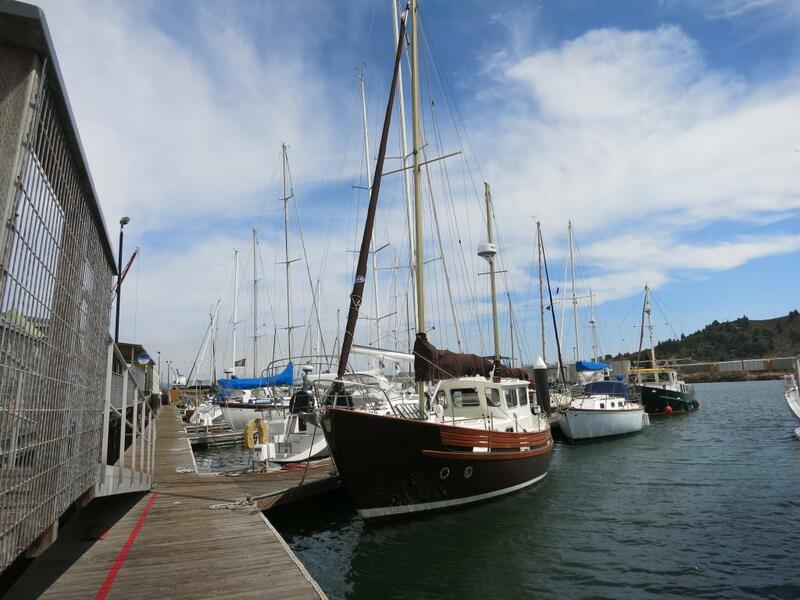 Get a Trawler that meets your needs and budget and charter or rent a real sailboat when you need the fix. The bayliner 38 series is a popular boat. More info on the bayliner forum. A Motor sailor is a great way to have a Blue Water cruiser. The scantlings are ocean grade and the sails allow almost unlimited range. A Bayliner is in no way an offshore vessel. Decide just what you want to do, Ocean Voyaging or inshore lakes , bays and rivers. The ocean voyager will set you back about 300% more for the boat , power or sail. The shucker that donsan posted looks clean with low hours. Looks like a sailboat hull with no mast. I didn't like how the rudder restricts pulling the shaft without dropping the rudder, but with a protected prop and skeg, you shouldn't have to do that often, and if you do, it will likely be on the hard. That's definitely worth a look...Only 4 hours or so away from you too.. There are a few Fishers for sale on the East coast. Check out the Fisher Owner's Group. That Schucker is an interesting boat for sure but It's gonna be very rolly I bet. Hang on! If those pix really represent the current condition of the Shucker what are you wasting time here for. Go for it. You have probably seen this listing but I boarded this boat in Port Townsend for a preview. Really liked it but got distracted for another in the mean time. I think it could be hauled cross country with that beam and the price is sort of in your range. Good solid builder in my view. Not much of a sailing rig I expect but a little downhill assist and roll abatement anyway. Motorsailers should do well do well on a reach. Our marina neighbor next door is a Bayliner 3888. Very nice boat, lots of great things about it, but that really high ladder to the flybridge would be a deal killer for us. We're still physically capable of climbing ladders all day, it's just darn inconvenient. Try getting a dinner and drinks tray to the bridge. Or guests and relatives who aren't spry. Ladders, tiny steps, and seven-vertical feet of stairs (with head-bumping clearance) are just three reasons I don't miss a flybridge. The list of negatives is longer. Nevertheless, the vast majority of our boats have flybridges which means one has limited choice. Fortunately, most motorsailers don't have a flybridge. Whenever someone mentions motorsailer I tend to think of the Nauticat 33 Pilothouse Ketch. I really love the look. They are made in Finland. The 33's are usually listed below 80G. Fishers are handsome motorsailers, but not inexpensive.